Courtesy The Howard Hughes Corp. The Waiea, The Howard Hughes Corp.’s luxury residential high-rise on Ala Moana Boulevard, will feature one of the most unique exterior designs among the high-rises in Kakaako, reflecting the area in which it is being built. 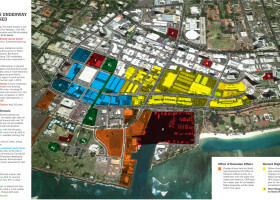 Rob Iopa, president of Honolulu’s WCIT Architecture, who had a major role in designing the tower on a former surface parking lot in Ward Village, shared with PBN the story behind the design. The tower, Iopa said, has two segments, the taller and shorter parts, with a net that creates the glass facade. 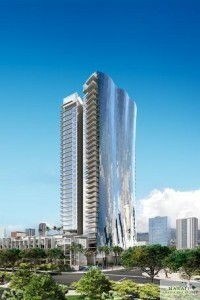 Another part of the story is that the Waiea is a rare example of a local architectural firm playing a major role in the exterior design of a new Kakaako high-rise. Most of the design work is going to out-of-state firms. Find out why in PBN’s Friday print edition.